1. Cheyney’s on-campus Institute for the Contemporary African-American Experience, which is a cultural solutions-oriented think tank involving a collaboration with the likes of Thomas Jefferson University’s Medical College that will build a medical facility on campus, Epcot Crenshaw Corporation that will relocate its environmental consulting headquarters on campus, Starbucks Foundation, a hotel chain that is discussing plans to construct a hotel/conference center on campus, and other powerful public/private partners to promote the academic, employment, and community service interests of Cheyney students. 2. Cheyney’s distinguished “Keystone Honors Academy” that is a far-reaching academic excellence program fostering intellectually enriching experiences for students with impressive GPAs. In addition, it positions students to receive Bond-Hill Scholarships that provide for complete tuition funding to attend state graduate programs in the fields of medicine, law, education, and business. 3. Cheyney’s new $23 million 43,000 square foot state-of-the-art Science Center. Good news? Yes! Great news? Absolutely! So why is Pennsylvania State System of Higher Education (PASSHE) Chancellor Daniel Greenstein raining on Cheyney’s parade with his malicious at worst or reckless at best comments to the state legislature and the media? For example, on February 21, he said everyone must “acknowledge the likelihood that (Cheyney) university will lose accreditation.” As a result, he continued, Cheyney should consider being downgraded to a type of non-degree vocational status or being swallowed up as a small subsidiary (like a colony) of one of the larger (i.e., white) state universities. Doesn’t the Chancellor understand the historic importance of HBCUs — especially the oldest one in America? Doesn’t he understand they came into existence because Blacks were excluded from white colleges and universities? Doesn’t he understand that despite the fact that there are only 100 HBCUs, which constitutes just three percent of this country’s colleges and universities, they nonetheless produce 20 percent of Black graduates in all majors and 25 percent of Black graduates in STEM (science, technology, engineering, and mathematics) majors? Doesn’t he understand that HBCUs provide a stable and nurturing environment for- generally speaking- first generation, low-income Black students? Doesn’t he understand that HBCUs present Black students with positive administrative and faculty role models who, by definition, promote the self-confidence needed to be prepared for the racism graduating students will encounter in America’s professional world? 1901 — While Cheyney was a stand-alone teacher training school, the Commonwealth of Pennsylvania paid the full yearly tuition and stipend of $140 to white students to attend white state-owned teacher training schools but paid only $25 to Cheyney students. 1969 — The Commonwealth was identified by the U.S. Department of Education as one of the ten worst states (including the usual suspects, namely Mississippi, Georgia, North Carolina, et al) discriminating against Blacks in higher education. 1983 — The Commonwealth, for the first time ever, finally submitted a formal anti-racial discrimination proposal that was deemed acceptable by the U.S. Department of Education following repeated warranted rejections. But it was later discovered that proposal wasn’t worth the paper it was written on. 1999 — At the insistence of the U.S. Department of Education’s Office for Civil Rights, the Commonwealth signed a contract to resolve issues of racial discrimination against Cheyney. Commonwealth officials signed that contract which, by last year, should’ve resulted in at least $100 million to Cheyney for essential resources including attractive academic courses, quality administrators, new buildings, etc. However, 20 years later, most of that $100 million is still contractually owed to Cheyney. 1. Has Cheyney’s “financial resources, funding base, and plans to assure long-term financial stability” continued to sufficiently improve? 2. Has the “implementation of budget reductions agreed to as part of the PASSHE-authorized debt forgiveness plan” sufficiently continued? The answers are yes, yes, and yes. In fact, MSCHE has already used phrases like “compelling evidence” and “significant progress” to describe Cheyney’s amazing turnaround. That’s a great sign in connection with MSCHE’s upcoming decision in November. And MSCHE will be quite impressed to know that applications for admission to Cheyney are higher than at any time in the past ten years with offers extended to more than 1,500 students in 2019 compared to only 351 last year. It’ll also be quite impressed with the aforementioned public/private partnerships. Additionally, it’ll be quite impressed that Cheyney is on a path to a balanced budget in the 2019 fiscal year after a nearly $8 million expenditure reduction plan along with a “Resurgence” fundraising plan led by alumni. Speaking of that “Resurgence” fundraising plan, Cheyney needs to raise at least $4 million by June in order to help guarantee its continued existence forever. 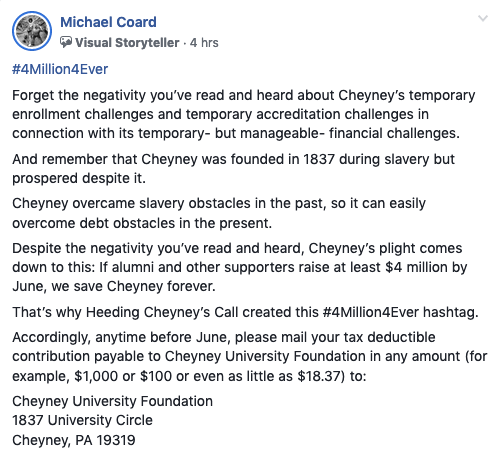 As a member of Heeding Cheyney’s Call (heedingcheyneyscall.org), I encourage alums and other Cheyney supporters to participate in what we’re calling #4Million4Ever. You can participate by donating $1,000 or $500 or $100 or just $18.37 to the Cheyney Sustainability Fund at the Cheyney University Foundation, 1837 University Circle, Cheyney, PA 19319. Michael Coard, Esquire can be followed on Facebook, Twitter, and Instagram. His “Radio Courtroom” show can be heard on WURD96.1-FM. And his “TV Courtroom” show can be seen on PhillyCam/Verizon/Comcast. In 2017 on November 17, the Middle States Commission on Higher Education (MSCHE) officially informed Cheyney University that its accreditation would continue for at least another year. And this year, a few days ago on November 19, MSCHE issued a similar notification. That’s wonderful because, without accreditation, a university cannot receive federal or state financial aid for its students. And since about ninety percent of Cheyney’s students are on financial aid, the loss of accreditation would have meant the death of my historic alma mater- the oldest Black institution of higher learning in America. 1. Have Cheyney’s “financial resources, funding base, and plans to assure long-term financial stability” continued to sufficiently improve? 2. Has the “implementation of budget reductions agreed to as part of the Pennsylvania State System of Higher Education (PASSHE)-authorized debt forgiveness plan” sufficiently continued? Thanks to Governor Tom Wolf, the Pennsylvania Legislative Black Caucus, the Council of Trustees, and especially President Aaron Walton, Cheyney continues to make substantial improvements, which means the answer to the three questions is a resounding yes. In fact, MSCHE used phrases like “compelling evidence” and “significant progress” to describe Cheyney’s amazing turnaround. Furthermore, under President Walton’s much needed business-oriented leadership, the university in July announced its on-campus Institute for the Contemporary African-American Experience, which is a cultural solutions-oriented think tank that will involve a collaboration with the likes of Thomas Jefferson University’s Medical College, Epcot Crenshaw Corporation, Starbucks Foundation, and other “movers and shakers” to promote the academic, employment, and community service interests of Cheyney students. 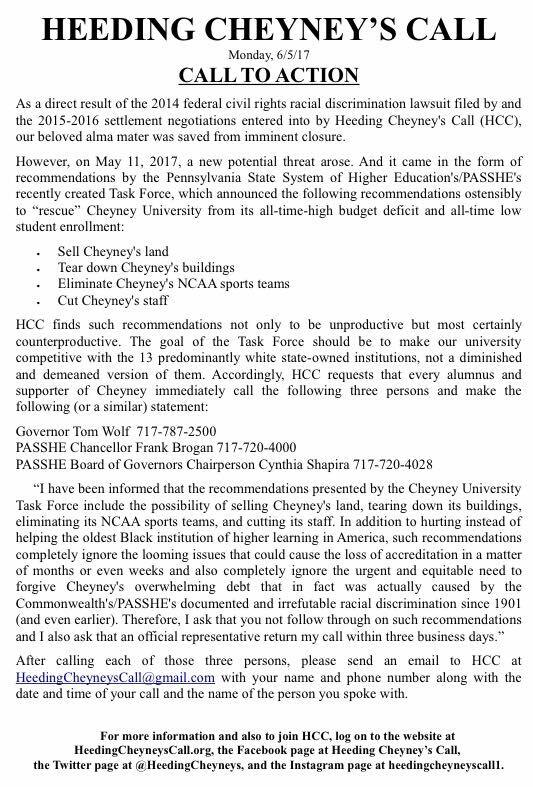 PASSHE recently issued a press release applauding Cheyney’s “transformational effort” to get things right. And I, in turn, applaud PASSHE’s applause. But I wish PASSHE had gone farther by issuing a statement that put Cheyney’s phoenix-like rising in context. In other words, I wish it had explained why Cheyney even needed to get things right in order to rise again. But since PASSHE didn’t, I will. 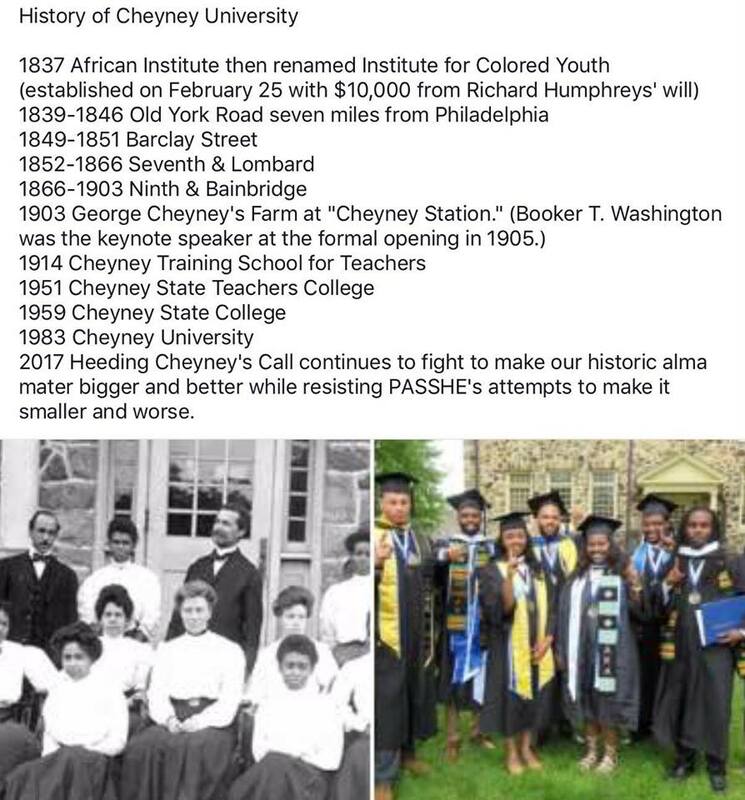 1901- While Cheyney was a stand-alone teacher training school, the Commonwealth paid the full yearly tuition and stipend of $140 to white students to attend white state-owned teacher training schools but paid only $25 to Cheyney students. 1969- The Commonwealth was identified by the U.S. Department of Education as one of the ten worst states (including the usual suspects, namely Mississippi, Georgia, North Carolina, et al) discriminating against Blacks in higher education. 1983- The Commonwealth, via PASSHE, for the first time ever, finally submitted a formal anti-racial discrimination plan that was deemed acceptable by the U.S. Department of Education following repeated warranted rejections. But it was later discovered that plan wasn’t worth the paper it was written on. 1999- At the insistence of the U.S. Department of Education’s Office for Civil Rights, the Commonwealth, via PASSHE, signed a contract to resolve issues of racial discrimination against Cheyney. Then-Governor Tom Ridge, through his PASSHE Chancellor James McCormick and his Secretary of Education Eugene Hickok, signed that contract which, by 2018, should’ve resulted in $100 million to Cheyney for essential resources including attractive academic courses, quality administrators, new buildings, etc. However, 19 years later, PASSHE still owes Cheyney much of that $100 million. Despite the wounds, Cheyney began to heal and always remained accredited. But, technically speaking it’s not a finalized accreditation. Cheyney has until August 25, 2019 to submit a report to MSCHE concerning the three aforementioned questions and until November 21, 2019 to “demonstrate compliance” with MSCHE’s standards. That means Cheyney has until near the end of next year to have its severe financial and institutional problems resolved, which means, among other things, that PASSHE must provide the financial and institutional resources it owes. President Walton is doing great and innovative work. And he is doing it, in large part, by dealing diplomatically with PASSHE on Cheyney’s behalf. 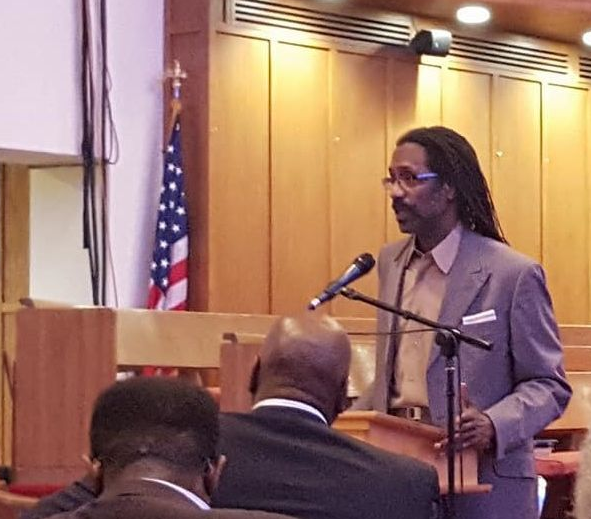 In that regard, he reminds me of a Martin Luther King-type diplomat, But Heeding Cheyney’s Call (HCC)- which was founded in 2013 by Professor E. Sonny Harris and Junious Stanton and of which I am a proud member- is much more confrontational in its approach. In that regard, we remind ourselves and others of a Malcolm X-type activist. That is why we filed a major civil rights lawsuit against PASSHE in federal court in 2014 and organized a massive rally against PASSHE in the Harrisburg State Capitol in 2015. And we’ll do them both again if we have to. We’ll fight in the courts and in the streets for Cheyney- and we’ll do so “by any means necessary.” But we hope we won’t have to again since PASSHE now seems more like a friend than a foe. In Greek mythology, the phoenix rises from the despair of destruction to the ecstasy of excellence. Cheyney — the oldest black institution of higher learning in America, founded in 1837– rises, thanks to Gov. Tom Wolf, state Rep. and Pa. Legislative Black Caucus Chairman Jordan Harris, state Sen. and Cheyney University Council of Trustees Member Vincent Hughes, Cheyney University President Aaron Walton, Cheyney University Council of Trustees Chairman Robert Bogle, and others. They all came together last week to announce the creation of the school's on-campus Institute for the Contemporary African-American Experience (ICAAE), which is a cultural solutions-oriented think tank that will involve a collaboration with Thomas Jefferson University's Medical College, Epcot Crenshaw Corp., and Starbucks Foundation to promote the academic, employment, and community service interests of Cheyney students. That's wonderful news, most notably regarding Starbucks, assuming it doesn't call the cops on black students for "loitering" in classrooms. But I digress. Cheyney, an all-time great institution, during the past several years has had to confront an all-time low student enrollment along with an all-time high budget deficit. Although it continues to do so, the future looks bright thanks to the recent news. But why was the recent past so dismal? Was it the result of self-inflicted wounds or something external? >> READ MORE: Can Cheyney, the nation's oldest HBCU, survive? 1901: While Cheyney was a stand-alone teacher training school, the Commonwealth of Pennsylvania paid the full yearly tuition and stipend of $140 to white students to attend white state-owned teacher training schools but paid only $25 to Cheyney students. 1969: The commonwealth was identified by the U.S. Department of Education as one of the 10 worst states (including the usual suspects, namely Mississippi, Georgia, North Carolina, et al.) for discriminating against blacks in higher education. 1983: The commonwealth for the first time ever finally submitted a formal anti-racial discrimination plan that was deemed acceptable by the U.S. Department of Education following repeated warranted rejections. It was later discovered that plan wasn't worth the paper it was written on. 1999: At the insistence of the U.S. Department of Education's Office for Civil Rights, the commonwealth signed a contract to resolve issues of racial discrimination against Cheyney. State officials signed that contract which, by this year, should've resulted in at least $100 million to Cheyney for essential resources, including attractive academic courses, quality administrators, new buildings, etc. However, 19 years later, most of that $100 million is still owed to Cheyney. But the past is the past. The aforementioned elected officials and corporate leaders deserve tremendous accolades for doing the right thing. That right thing — first and foremost — must be to maintain Cheyney's historic mission of educating black students. That right thing is unlikely to have ever been done if not for the raucous but focused activism and federal court litigation of the coalition Heeding Cheyney's Call and members of the extended Cheyney family. Now, everyone from the governor to Cheyney's incoming class deserves praise because they all helped — and are helping — Cheyney to rise again. I rise. I rise. I rise." That great poet could've easily been referring to Cheyney University. 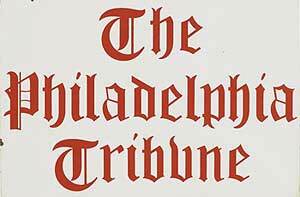 Michael Coard, a Philadelphia lawyer, graduated from Cheyney in 1982. 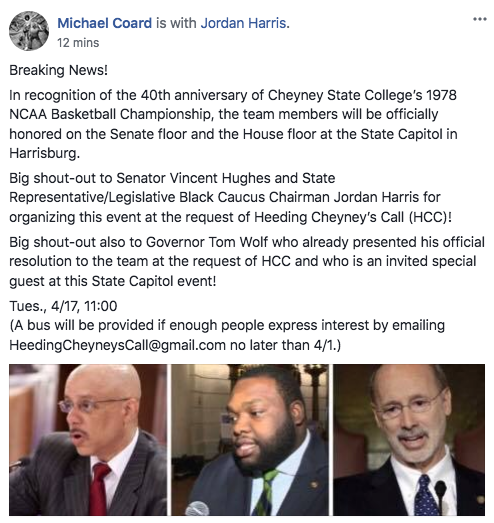 In celebration of its upcoming 40th anniversary, the members of Cheyney State College’s 1978 NCAA Championship Basketball Team- along with Hall of Fame Coach John Chaney- will be honored with an official City Council Resolution introduced and presented by Councilwoman “Jannie From Cheyney” Blackwell! And they’ll also be honored at the same time with a Mayoral Proclamation, a Gubernatorial Proclamation, a State House Citation, a State Senate Citation, and a Congressional Resolution. The entire Cheyney family must show its support by attending this historic celebration. For more info, contact HeedingCheyneysCall@gmail.com. On behalf of Heeding Cheyney’s Call (HCC) and in the spirit of alma mater unity, I restrained myself during my brief speech immediately following President Walton’s speech at CUNAA’s Homecoming meeting. That’s why HCC will be watching all state appointees and officials to make sure they don’t prescribe future academic, financial, and staffing medicine (e.g., slashing academic programs, selling land, eliminating sports, and retrenching essential faculty members) that’s worse than Cheyney’s present budget and enrollment disease. That’s also why HCC will be attending the President’s meeting on 11/2 at 11:30 in Biddle Hall, room 301. P. S. The meeting will be streamed live on Facebook by Heeding Cheyney's Call. When it was rumored this year Cheyney would die on or shortly after Sept. 1 due to accreditation noncompliance, Gov. Tom Wolf on Aug. 22, by way of his Pennsylvania State System of Higher Education (PASSHE) Board of Governors, threw Cheyney a much-needed lifeline in the form of a $30 million infusion. As a result of that, the governor, who told Heeding Cheyney’s Call in 2015 that “Cheyney would not die on ... (my) watch,” proved not only that he’s a man of his word but also that he appreciates the cultural, educational, and essential importance of HBCUs in general and Cheyney University in particular. Kudos to Wolf! End of story? Nope. There’s more. And it ain’t great. 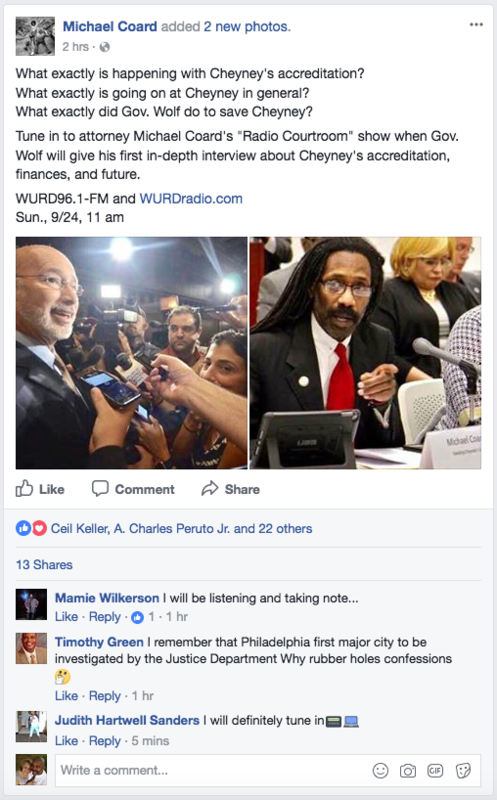 First of all, without that $30 million from Wolf, Cheyney would be dead by now. Accordingly, that part is clearly great. But the other parts of Cheyney’s situation, which include the strings attached to that money and also include something called the Cheyney University Task Force, are not so great. 1. The Middle States Commission on Higher Education (MSCHE) told Cheyney on June 22 that the school could keep its accreditation only if it submits a substantive “monitoring report” by Sept. 1 that shows compliance with two basic concerns: financial planning (i.e., revenue with strategies) and administrative permanence (i.e., presidential stability). By kicking in that $30 million and by previously initiating the steps to begin the national search for a permanent (instead of interim) president at Cheyney, the governor pretty much guaranteed the school’s accreditation compliance. 2. That $30 million has been erroneously described by state officials and in the media as debt “forgiveness.” But it was actually a debt “waiver.” To “forgive” someone means to excuse that person for a wrongdoing. But Cheyney did nothing wrong to the state and Cheyney owed nothing to the state. Quite the contrary, based on an agreement that then-Governor Tom Ridge, through his PASSHE Chancellor James McCormick and his Secretary of Education Eugene Hickok, signed in 1999 during negotiations with the federal Office for Civil Rights to finally end PASSHE’s discrimination against Cheyney, PASSHE as of 2017 still owes Cheyney most of the $100 million required in that contract. Therefore, that recent $30 million was not “forgiven.” It was “waived.” To “waive” something means to refrain from insisting upon it. In other words, stop bothering me ‘cause I don’t owe you nothin’ and you know it. In fact, you owe me. Where’s my money? 3. That $30 million waiver is conditional. It goes into effect only if Cheyney achieves and maintains a balanced budget over the next four years. What does that mean? That means PASSHE should and must provide the additional and equitable financial resources that Cheyney will need — and that are owed to Cheyney — during that four year period and beyond. 4. On May 11, a recently formed entity known as the Cheyney University Task Force distributed its report during a presentation on campus. That Task Force consists primarily of PASSHE people. It has only three Cheyney persons including Council of Trustee Chairman Robert Bogle and Council of Trustees members Sen. Vincent Hughes and Samuel Patterson, all three of whom have been and continue to be strong advocates in the battle to save and enhance the university (along with Rep. Jordan Harris whom we have adopted as a member of our family due to his pro-Cheyney tenacity). Based on this PASSHE dominance, shouldn’t this group be called the PASSHE Task Force? I’ll address that in an upcoming column. The last time I checked, a “plan” is defined as a “method for achieving an end.” And that word, “plan,” is used twice on page eight of the report. Also, on that same page, the report lists the “sale” of Cheyney University’s land as one of “various options.” I’m a lawyer and I know legal double-talk when I see it. Why is the selling of this historic land even a consideration? I’m sure George Cheyney, who transferred his farmland to our beloved Institute for Colored Youth in 1902, is turning over in his grave regarding such an option or consideration or possibility or whatever other euphemism the task force chooses to use. Despite all of that, the task force is now saying the land definitely won’t be sold and the NCAA teams definitely won’t be eliminated. I’ll hold the task force and the interim president to that in the event they catch a sudden case of amnesia. Although the substantive “monitoring report” was due September 1, the final accreditation decision won’t be made by MSCHE until Nov. 16. 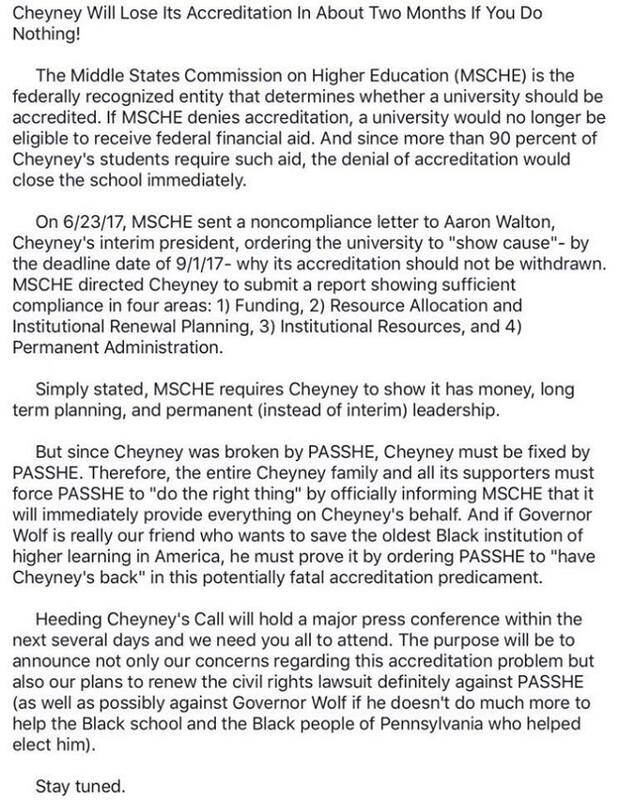 Let’s keep the pressure on PASSHE, the task force and the interim president so Cheyney, born 180 years ago in 1837, doesn’t die but instead remains alive and well for another 180 years. Michael Coard, Esquire can be followed on Facebook, Twitter and Instagram. His “Radio Courtroom” show can be heard on WURD96.1-FM. His “TV Courtroom” show can be seen on PhillyCam/Verizon/Comcast. Heeding Cheyney’s Call hosted an informational meeting at Zion Baptist Church earlier last week, updating alumni and students on issues facing the school and how they plan to move forward following a Cheyney University task force meeting. 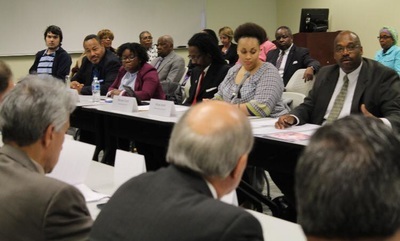 The meeting came just under a week after the Cheyney University task force — made up of state and elected officials, and some members of Cheyney’s Council of Trustees and Board of Governors — made recommendations. 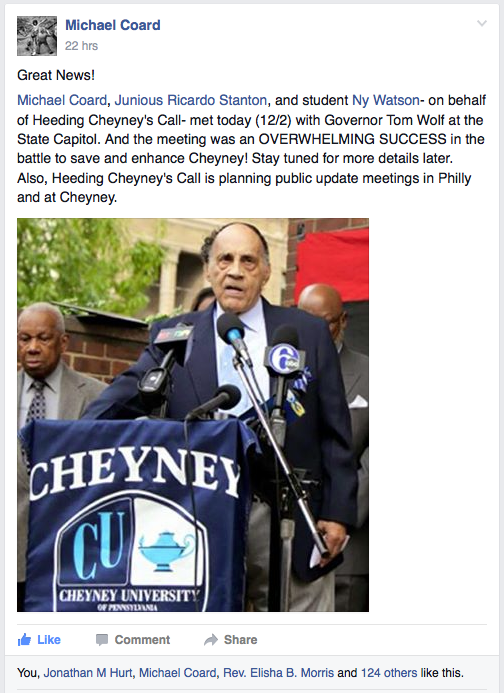 Heeding Cheyney’s Call said its meeting, which took place on Monday, was also organized to save the school. The meeting began with Coard dispelling rumors that have been circulating. He said that it is not true that Heeding Cheyney’s Call lost the 2014 lawsuit filed against former Gov. Tom Corbett’s administration. “Nothing could be further from the truth. We ... [had] the case dismissed without prejudice. We always had and still have the case on the back burner,” he said. “As of January 2016, we withdrew it in order to settle. As a result of this task force, we are going to reinstate it.” Coard is referencing a set of recommendations made by the task force to improve enrollment, academics and finances, among other items. Coard said Cheyney’s combined state and federal debt is “between $75 million and $90 million” and that decades of discriminatory funding have put it in a position where it cannot afford to support itself or pay its debts. The other rumor Coard dispelled is the idea that “West Chester has taken over Cheyney.” However, an education professor, Dr. Wesley Pugh did confirm they are in discussions with West Chester and other mainstream state schools regarding potential collaborations. Junious Stanton, a Heeding Cheyney’s Call organizer said accreditation is the biggest and most imminent threat Cheyney has right now. As the meeting closed, organizers asked the meeting attendees to write suggestions that would help save Cheyney. Some vocalized their recommendations, stressing the need for tangible and intangible supports, including consistent financial donations and prayer. April Moye, a 2015 social relations graduate, pushed for a united front. “I feel like Cheyney just needs to come together, to move forward to get what we need done,” she said. 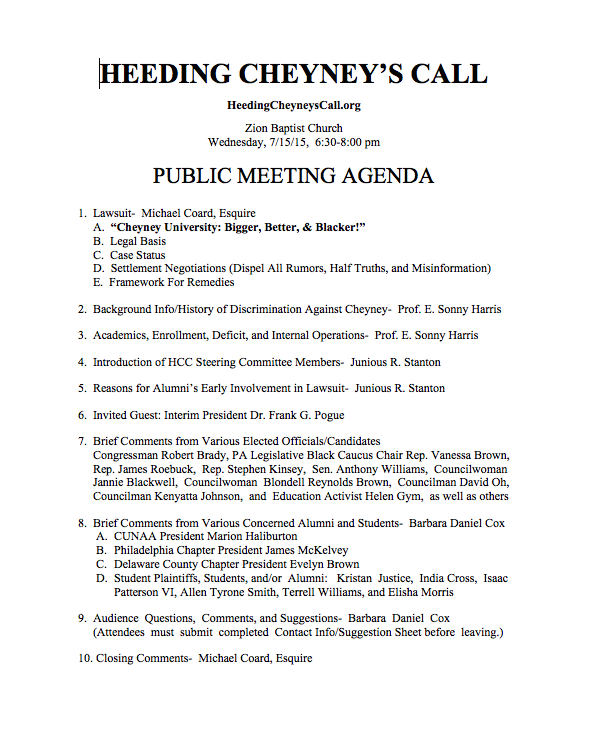 ATTENTION: The Heeding Cheyney's Call meeting at Zion Baptist Church, North Broad and Venango in Philadelphia, on Monday, June 5th at 7:00PM will be video streamed live through THIS FaceBook page, Heeding Cheyney's Call. If you are NOT a member of this page? Simply ask to be added. Will Cheyney Be Killed Like Octavius Catto? On October 10, 1871, Cheyney University/Institute for Colored Youth professor Octavius Catto was murdered by racists in Philadelphia as part of a plan to crush Black advancement by using bullets and assassins to do the execution. On May 11, 2017, Cheyney University was targeted for murder by racism just outside Philadelphia as part of a plan to crush Black advancement by selling its land, cutting its staff, tearing down its buildings, and eliminating all of its NCAA sports teams, while drowning it in debt and causing it to lose its accreditation by using bureaucrats and appointees to do the execution. It happened to Catto, who was a prominent voting rights and civil rights activist, on Election Day near his home at Eighth and South streets when a white man murdered him with two shots to the body. By the way, the artistic rendition shown above was included with this column because it is the only one based upon purported witness testimony during the 1877 trial. Unfortunately, it is not precisely accurate because, although it shows Catto with a gun, he was neither holding it in his hand nor displaying it when he was attacked. In fact, he had just purchased it minutes earlier for self-defense in response to relentless racist death threats. Moreover, it was unloaded. 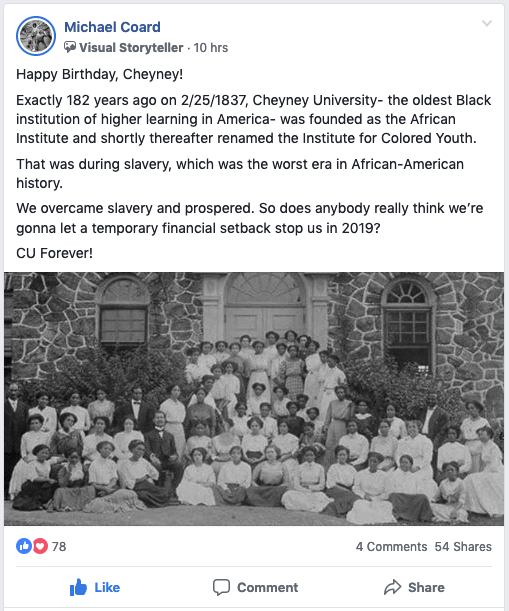 It happened to Cheyney University — which, having been founded in 1837, is the oldest Black institution of higher learning in America- on the day that the Task Force (created by the Pennsylvania State System of Higher Education’s/PASSHE’s Board of Governors) met near Philadelphia on Cheyney’s campus. That was when the Task Force publicly presented a plan that purportedly and inexplicably is designed to save Cheyney by selling, cutting, tearing down, and eliminating, while ignoring the fact that it is drowning in debt and facing imminent loss of accreditation. 1901- While Cheyney was a stand-alone teacher training school, the Commonwealth of Pennsylvania paid the full yearly tuition and stipend of $140 to white students to attend state-owned teacher training schools but paid only $25 to Cheyney students. 1969- The Commonwealth, as recently as 1969, was one of just ten states (including the usual suspects, namely Mississippi, Georgia, North Carolina, et al) determined by the U.S. Department of Education to have been blatantly discriminating against Blacks in higher education. 1983- It was not until 1983 that the Commonwealth, for the first time ever, finally submitted a formal anti-racial discrimination plan that was deemed acceptable by and to the U.S. Department of Education following repeated warranted rejections. 1999- At the insistence of the U.S. Department of Education’s Office for Civil Rights, the Commonwealth was compelled to “do the right thing” by signing a formal agreement to resolve then-unresolved issues regarding racial discrimination against Cheyney. However, that agreement has been breached by the Commonwealth and, as of 2017, those issues remain unresolved. As a result of that breach, the Commonwealth, since 1999, owed Cheyney at least $100 million as of 2015 (and obviously much more now in 2017). Cheyney is in dire straits because of the Commonwealth’s documented and irrefutable racial discrimination. If the Commonwealth/PASSHE ends the racism, it’ll end Cheyney’s plight. Just pay us what you owe us as reparations in the form of debt forgiveness, attractive academic programs, student tutorial services, and other long-overdue and well-deserved essential resources. I’m not ready to completely condemn the Task Force, at least not yet. I’m willing to give it a chance because it includes some people of good will who have sacrificed much for Cheyney. But I gotta give the “side eye” to anything connected with PASSHE because its treatment of Cheyney has been suspect to say the least. But it does seem to be kinda/sorta trying to do the right thing in order to keep Cheyney’s doors open. However, when the person who threw you down a deep hole by racially discriminating against you since 1901 (and earlier) now offers you a golden ladder, check to make sure it doesn’t have slippery oil on the rungs and sharp spikes at the bottom. You have to be really careful when the person who has been trying to destroy you for so long suddenly offers what appears to be a wonderful gift. 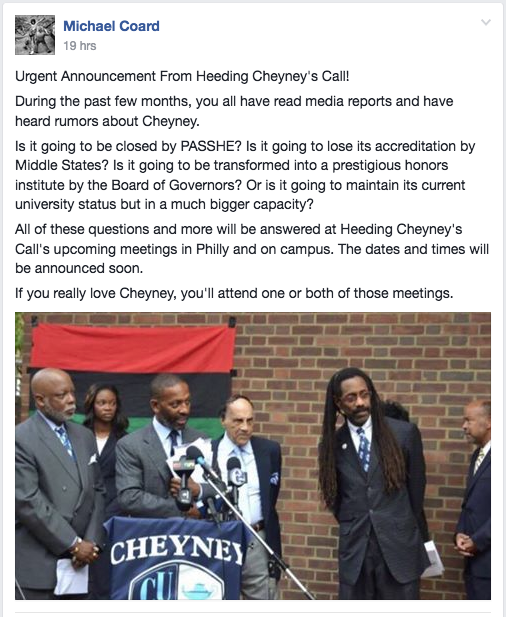 There are many rumors and lots of misinformation being spread about Cheyney’s status and future. There are many alums, students, and supporters who want to help Cheyney. And the only way to dispel those rumors and correct that misinformation and provide that help is to attend a public meeting sponsored by Heeding Cheyney’s Call (HCC). That meeting will be held on Monday, June 5 at 7:00 pm at Zion Baptist Church, Broad and Venango. By the way, HCC is making arrangements to have the meeting live-streamed on the internet for those who are unable to attend. Log onto HeedingCheyneysCall.org for more details. In conclusion, Octavius Catto wants his Cheyney alumni family to avenge him by rescuing our historic institution. Are you gonna ignore him and allow his and our alma mater to be murdered? Michael Coard, Esquire, can be followed on Facebook, Twitter, and Instagram. His “Radio Courtroom” show can be heard on WURD900AM.And his “TV Courtroom” show can be seen on PhillyCam/Verizon/Comcast. Why Cheyney deserves to be saved: alumni, faculty and students make their case. 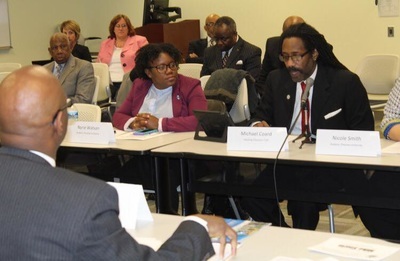 As shown in the following four photos, Heeding Cheyney's Call (HCC) presented strong arguments for "increased Cheyney funding and additional Cheyney resources" today (5/10) at the House Democratic Policy Committee hearing at PASSHE's Center City office. Those arguments were so persuasive that each of the 15 legislative committee members- both Black and white!- indicated their support for HCC's efforts to save and enhance historic Cheyney University. When Pennsylvania Rep. James R. Roebuck Jr. was a college student in the mid-1960s, he took a course in state and local government taught by Professor Norville Smith at Cheyney University in Thornbury. He eventually earned his doctorate in history at the University of Virginia. “I always point out the irony that the course I took at Cheyney is what I do now,” said the 70-year-old Democrat from Philadelphia. In his role as Democratic chairman of the state House education committee, Roebuck is now advocating for Cheyney, the nation’s oldest historically black institution of higher learning that was founded in 1837. 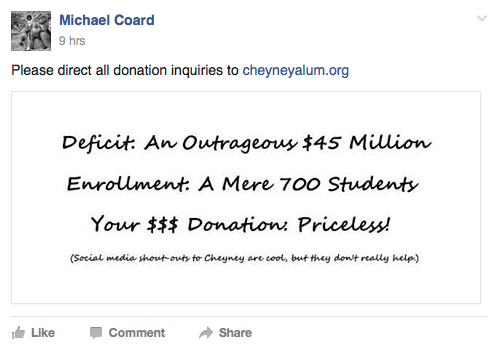 He believes Cheyney is underfunded. 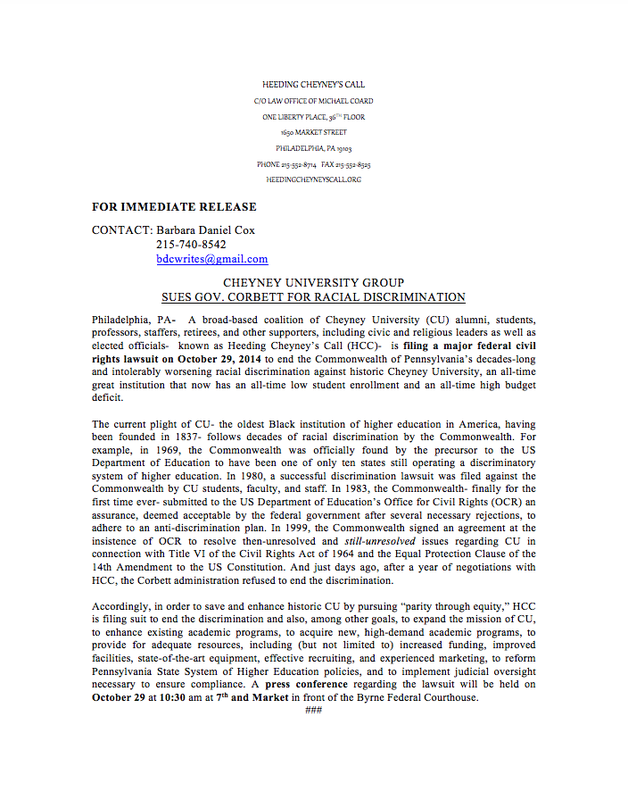 Tuesday morning, Roebuck along with fellow Philadelphia Democrats, state representatives Stephen Kinsey and Jordan A. Harris, chaired a House Democratic Policy Committee hearing on Cheyney funding at the Pennsylvania State System of Higher Education campus, Seventh and Market streets, in Philadelphia. Twelve other state representatives were in attendance as were about 30 audience members including alumni, students, former teachers and others connected with Cheyney. Among those who testified before the committee was Michael Coard, an attorney and 1982 Cheyney alumnus who is spokesman for Heeding Cheyney’s Call, a coalition formed in 2013 to advocate for his alma mater. In October 2014, Heeding Cheyney’s Call filed a civil rights lawsuit in Philadelphia U.S. District Court against then-Gov. Tom Corbett, the Pennsylvania Board of Governors and U.S. Secretary of Education Arne Duncan for what it maintains is intentional underfunding and failure to improve facilities at the historically black institution as compared to traditionally white ones. Officials at the Pennsylvania State System of Higher Education, also known as PASSHE, that oversees Cheyney and 13 other state-owned institutions of higher learning, maintained in 2014 that the amount of state appropriation provided per student at Cheyney University was more than three times the state system average and the percentage of the educational and general budget paid with state funds was significantly higher at Cheyney than at any other state system university. “Now it’s more like four times higher,” said PASSHE Media Relations Manager Kenn Marshall on Tuesday afternoon. The Middle States Commission on Higher Education last November put Cheyney on probation because of insufficient evidence that it is in compliance with several standards. 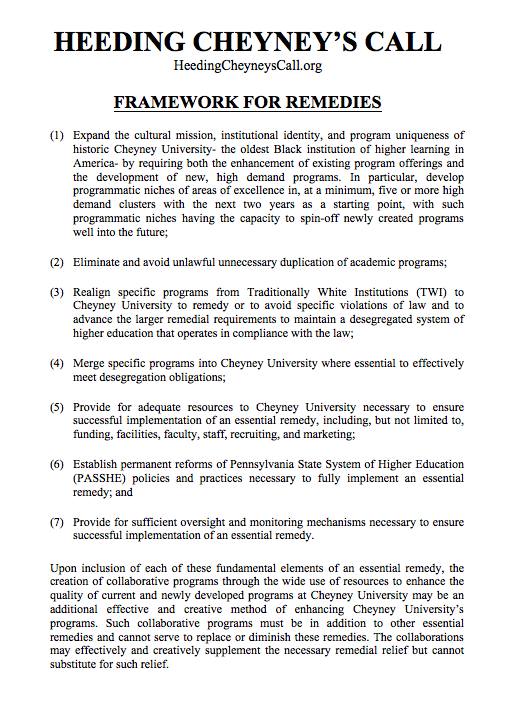 Cheyney remains fully accredited but has until Sept. 1 to produce a monitoring report documenting the implementation of a technology plan, the development and implementation of a long-term financial plan, steps taken to strengthen the institution’s finances and updated cash and financial projections for the next five years. In November, Marshall said Cheyney’s accreditation issues were not connected with Heeding Cheyney’s Call’s civil rights lawsuit, but Coard maintained that Cheyney’s probationary status is directly related to issues outlined in the lawsuit. “First, those complaints stem from historic as well as recent discriminatory underfunding by PASSHE that led to a lack of essential technological resources and essential financial aid resources. Second, PASSHE has consistently failed to appoint competent, technologically-savvy presidents at Cheyney,” said Coard last November. Coard noted on Tuesday that Heeding Cheyney’s Call rallying cry is “Parity Through Equity” and that members are seeking more than just equality in funding and resources from the state. “In other words, it has not come close to providing Cheyney University with the money, the facilities, the unique high-demand, non-duplicated programs, and the other resources that it owes and that equity demands,” said Coard on Tuesday. Roebuck said that among the other complaints he has heard about Cheyney are issues with maintenance, decaying infrastructure, mold and a consistent decline in enrollment that this spring was at 689 including 169 recent graduates, down from 1,586 in fall 2010. “The number of students who have applied for fall 2016 admission is up 55 percent right now compared to this time last year,” noted Cheyney University Director of Public Relations Gwen Owens at the end of March. Owens said that no Cheyney University administrators attended Tuesday’s hearing, a fact that Roebuck decried. He also assumed that PASSHE sent no representatives. However, Marshall said they were in attendance at the hearing, but did not testify. 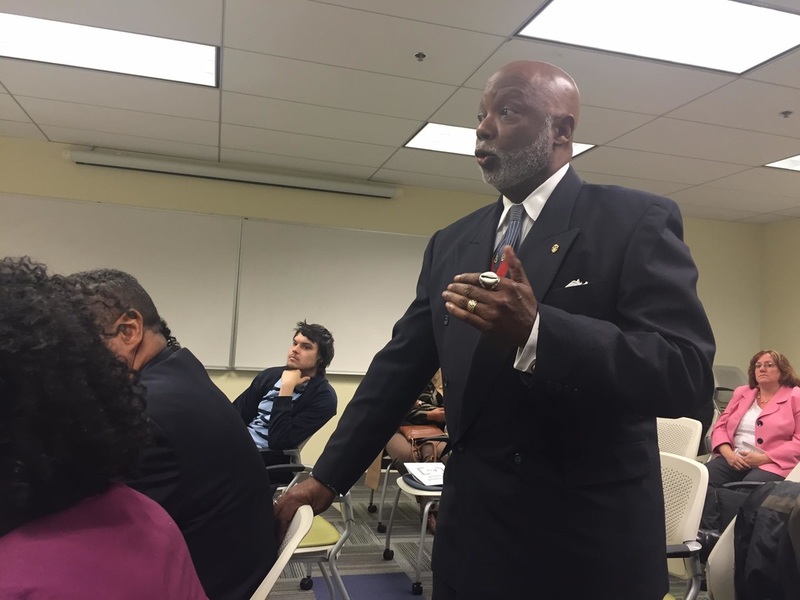 “We’re looking for a sitdown with Cheyney administrators and the state system to tie down a viable program of action that will address the needs of Cheyney University,” said Roebuck. Marshall noted that PASSHE officials regularly meet with state legislators and would be happy to meet with Roebuck at his convenience. 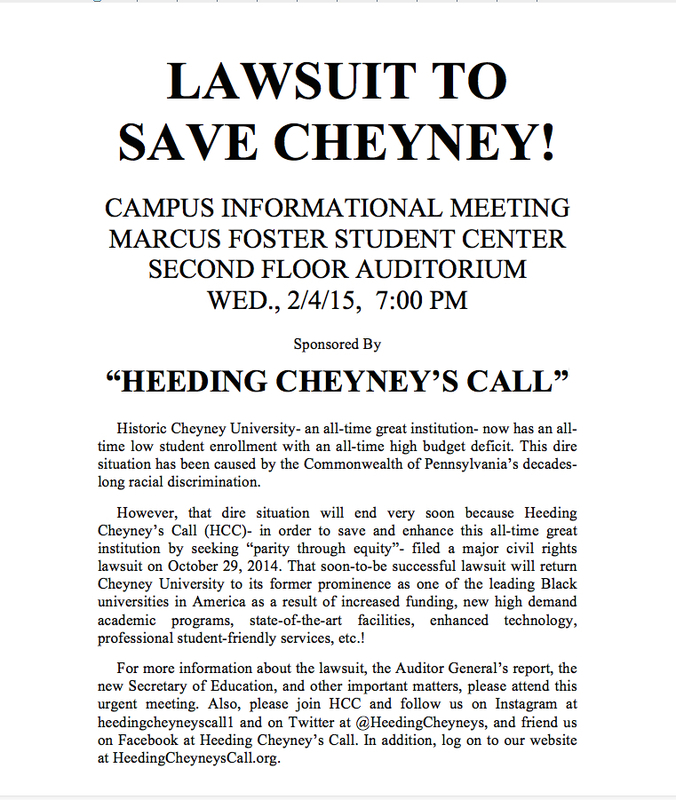 *Heeding Cheyney's Call used the legal system to win the battle to "save" Cheyney. *Now, Heeding Cheyney's Call is using the political system to win the battle to "enhance" Cheyney. *And we need your help on 5/10 to get that enhancement in the form of increased funding and additional resources. Spread the word. And be there! 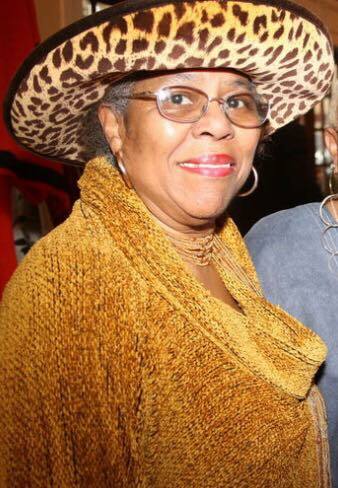 If Sonny Harris was the fire of Heeding Cheyney's Call- and he was- Barbara Daniel Cox was the soul. You can say whatever you want about her somewhat abrasive attitude at times. But you must admit that no one gave more time, more energy, and more passion to all Cheyney-related activities. Although we lost her today, she's now working directly with Sonny to continue the battle to save and enhance our beloved alma mater. Forget what PASSHE Chancellor Brogan and Republican State Senator Scavello said about Cheyney. Forget what certain hatin' administrators and staffers on campus said about the courtroom strategies and boardroom negotiations of Heeding Cheyney's Call. 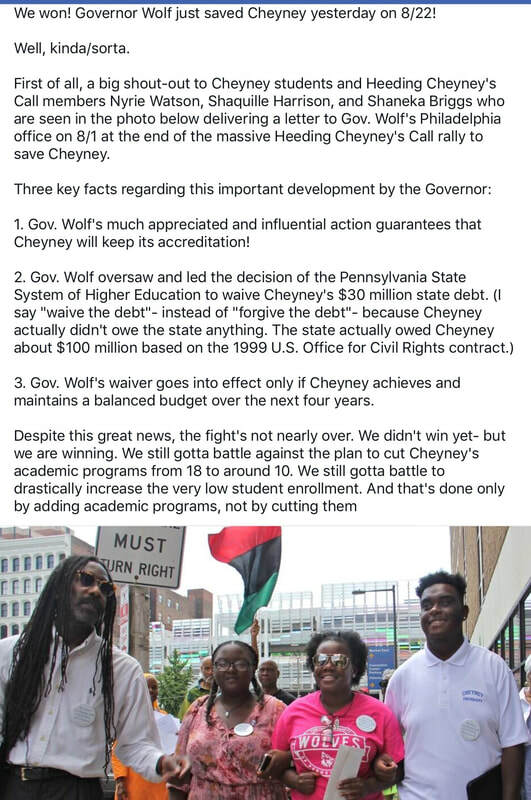 I can say this: As a result of the lawsuit and the settlement discussions, Governor Wolf informed Heeding Cheyney's Call today (3/28) that he's "not only committed to saving Cheyney but also to enhancing Cheyney." Join Heeding Cheyney's Call at the Council of Trustees meeting on Tuesday, 3/15 at 1:00 on the second floor of the Marcus Foster Student Alumni Center. You all have seen the video of Senator Scavello and PASSHE Chancellor Brogan (included in the post above from yesterday on 3/7) showing them discussing their plans to murder Cheyney. Well, Professor Sonny Harris- the founder of Heeding Cheyney's Call (HCC)- just sent me a message and here's what he said: "Cheyney ain't no goddamn supermarket. It's a super school!" 2. Also, ask why did they make the statements they made at the March 2d Senate Appropriations Committee hearing about Cheyney being like a supermarket that will shut down in 1-2 years. 3. And finally, ask what exactly they plan to do to save and enhance the oldest Black institution of higher learning in America, founded during slavery in 1837. After taking those steps, ask two other persons to do the same. And please email a summary of whatever responses you get from Scavello and Brogan to us at HeedingCheyneysCall@gmail.com. 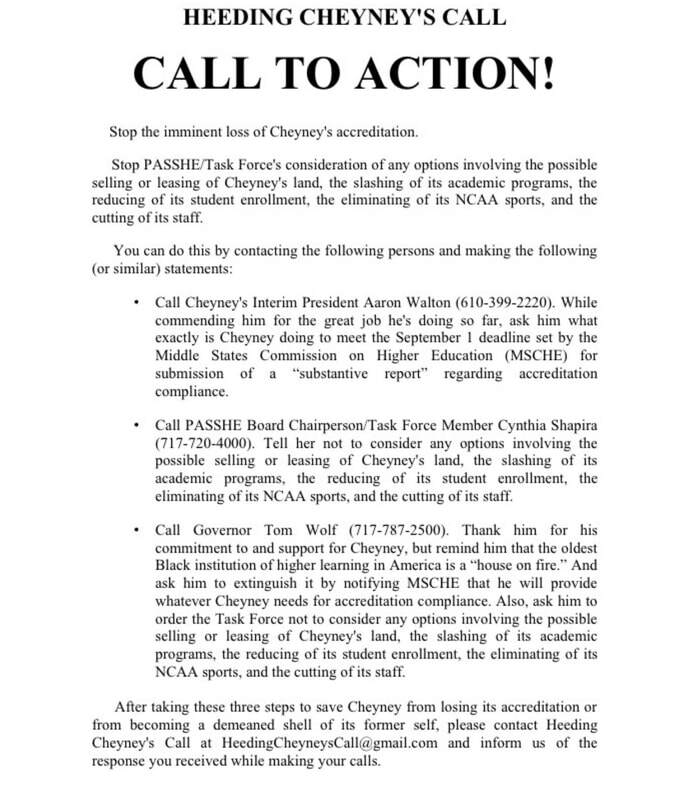 URGENT ACTION NEEDED TO HELP SAVE CHEYNEY RIGHT NOW! Please watch this 4 1/2 minute video and then make the following calls. As a result of the ongoing lawsuit filed by Heeding Cheyney's Call and the ongoing confidential and productive settlement negotiation that Heeding Cheyney's Call has been having with Gov. Wolf and his legal staff, Cheyney was not only saved but also was in the process of being enhanced. However, just a few days ago on March 2 at a Senate Appropriations Committee hearing, Monroe/Northampton County Senator Mario Scavello suggested- actually indirectly requested- that Cheyney be closed. And PASSHE Chancellor Frank Brogan agreed, giving our alma mater a 1-2 year death sentence! Please call Scavello at 717-787-6123 and Brogan at 717-720-4010. Tell them you're a member of Heeding Cheyney's Call and ask them why they're trying to kill the oldest Black institution of higher learning in America. And then ask them to log onto HeedingCheyneysCall.org to see indisputable proof that Pennsylvania has been racially discriminating against Cheyney since 1901 up to and including 2016. After you call, please post here on this Facebook page the response from Scavello and Brogan's offices. Let's put them on blast and shame them into ending their racial discrimination against Cheyney! 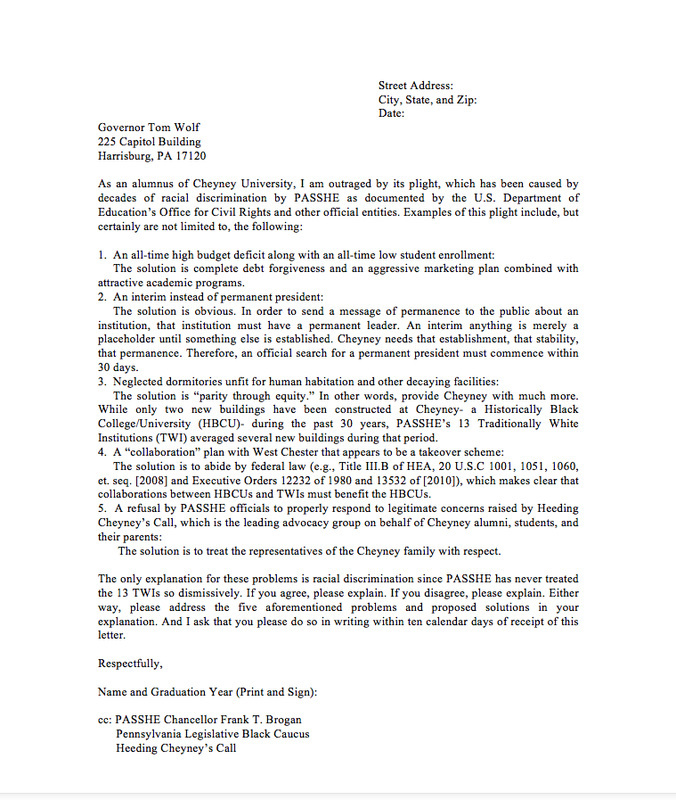 On behalf of Heeding Cheyney's Call (HCC), I submit this correspondence to factually and legally correct the public record in response to the invalid (hence misleading) press statement issued by PASSHE on November 10, 2015 minutes after hundreds of Cheyney University students, alumni, faculty, staff, friends, and influential legislative supporters attended a "Parity Through Equity" rally and press conference in the State Capitol Rotunda. PASSHE claims that "Cheyney University receives the highest amount of state funding per in-state student of any of the 14 State System universities... at nearly four times the System average...." But that claim is blatantly misleading because it is based merely on a partial truth- not on the truth, the whole truth, and nothing but the truth. PASSHE/Commonwealth of Pennsylvania's "contention that 'Cheyney currently receives almost three times as much in state appropriations per student as the other thirteen universities within PASSHE is mathematically and fundamentally flawed. As an illustration, if a school with a student population of one (e.g., Cheyney University) receives $100 from the Commonwealth, it could be disingenuously argued that the school gets more 'per capita' than a school (e.g., West Chester) with a student population of ten that receives $300 from the Commonwealth. The former would get $100 'per capita' while the other would get only $30 'per capita.' However, in total dollars, the latter nonetheless has gotten three times the former. Additionally, this 'per capita' characterization deceptively ignores the vastness of the larger school's facilities and resources relative to the smaller school's." 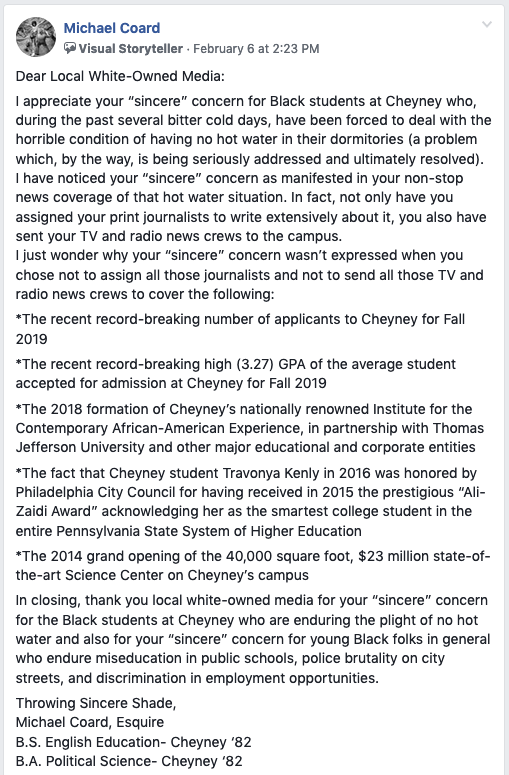 Please refer to the other portions of the aforementioned page two that address the real numbers regarding what Cheyney University actually receives. In fact, please refer to the entire four pages for complete and contextualized information. By the way, please note that HCC is not seeking mere "equality" in funding and resources. Instead, it is seeking necessary "equity," which, unlike mere "equality," factors in not just current discrimination but also the vestiges of past discrimination- including, but not limited to, more than a century of racist under-funding starting in 1901 when the Commonwealth provided $140 to white students in the state training to become teachers but only $25 to black students at Cheyney training to become teachers. This is the basis for HCC's rallying cry, "Parity Through Equity!" Other so-called computations in PASSHE's press statement are just as blatantly misleading, fundamentally flawed, and/or just plain wrong. They all will be addressed and exposed in future correspondence. In the meantime, it must be pointed out that, to the extent that Cheyney's per student costs have any significance, such ostensibly higher costs are irrefutable proof of PASSHE/Commonwealth of Pennsylvania's lack of investment to grow this historic university to a size large enough to yield reasonable economies of scale. Assuming arguendo PASSHE's numbers are complete and accurate (which they are not), they nonetheless are irrelevant. 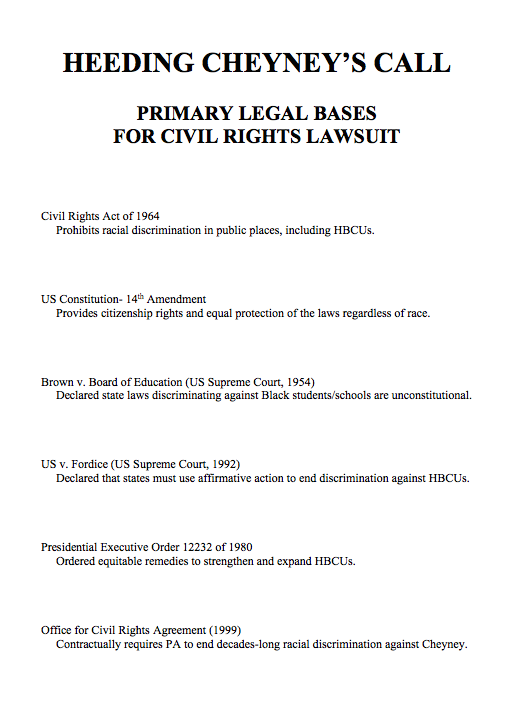 In a precedent-setting federal case, Knight v. Alabama, which dealt with many HBCU-related issues, including underfunding, and which was litigated for nearly 30 years before ending in 2006, the District Court ruled that a state's increased per pupil funding (over and above the per pupil funding for Traditionally White Institutions) is not sufficient to overcome or remedy the cumulative underfunding of HBCUs during the many years of de jure segregation/discrimination and continuing through subsequent years of de facto segregation/discrimination. Furthermore, as noted in the pivotal 1972 Adams v. Richardson federal case in the District of Columbia, the Commonwealth of Pennsylvania was identified in a 1969 Health, Education, and Welfare Department report as one of only five states in the country to have submitted higher education anti-racial discrimination plans that were consistently- and justifiably- rejected by the federal government as woefully inadequate. And it was not until 1983 that the Commonwealth finally submitted a plan that was deemed acceptable. But because the Commonwealth never sufficiently implemented that plan, the federal Department of Education's Office for Civil Rights compelled the Commonwealth to the negotiation table to hammer out a signed agreement mandating equitable treatment of Cheyney University. However, the Commonwealth has breached its own signed agreement, which was a primary basis for the federal civil rights lawsuit filed against it by HCC in 2014. In other words, it has not come close to providing Cheyney University with the money, the facilities, the unique high-demand, non-duplicated programs, and the other resources that it owes and that equity demands. Heeding Cheyney's Call (HCC) will hold a public meeting on campus in the Marcus Foster Student Center on Monday, 2/15 at 1:15. The purpose is to dispel the rumors and to update the Cheyney family about HCC's recent victories in a Philadelphia courtroom and a Harrisburg boardroom. Please note that the Philly meeting will be held on Monday, February 22 at 6:30 at Zion Baptist Church, Broad & Venango (instead of February 24). There is a rumor being spread on Cheyney's campus that the lawsuit filed by Heeding Cheyney's Call (HCC) has recently been dismissed. That is a damn lie and the person who started that rumor- and whose name I won't mention (at least for now)- is a damn liar. Not only has the lawsuit NOT been dismissed, the complaints raised in that lawsuit have been strengthened, thanks to the legal prowess of HCC's lead attorney Joe Tucker, Esquire and to HCC's productive, ongoing, and confidential negotiations with Governor Tom Wolf himself! HCC did not want to publicly and prematurely mention anything about those negotiations because they're confidential. But we are compelled to say something now because of the malicious rumor being spread by a certain person. Stay tuned for further info when HCC schedules its next public meeting in Philly and on campus. 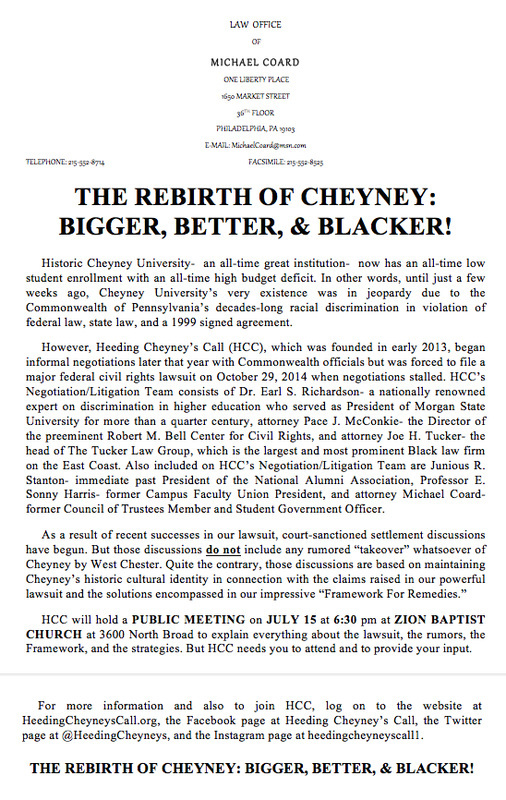 By the way, because of HCC's lawsuit and the negotiations that resulted from that lawsuit, Cheyney is now much closer to becoming "Bigger, Better, and Blacker!" Last week’s column was one of two parts. In it, I wrote that the U.S. Department of Education was expected to soon release its response to the scathing Aug. 26, 400-page report by Financial Aid Services, Inc. (FAS) that condemned Cheyney University for failing to track or “reconcile” what was initially believed to be $48.9 million in federal grants and loans to students from 2011-2014. However, as of the writing of this column, that response has not been released. Despite that, there’s still a lot of important news about Cheyney. FAS, which was contracted by the Pennsylvania State System of Higher Education (PASSHE), concluded that the $48.9 million figure was inaccurate and that the correct amount is $29.6 million. Accordingly, the Education Department is deciding how much, if any, of that amount has to be returned and what, if any, penalties will be assessed. I must concede the obvious: some Cheyney staffers and managers screwed up royally. In fact, the report indicates that they made paperwork and accounting mistakes in almost 85 percent of about 4,400 financial aid documents during the three-year period beginning in 2011. I love Cheyney and I always defend Cheyney. But I gotta admit that this is indefensible. But it is explainable. Consider this: If West Chester University (WCU) or Indiana University of Pennsylvania or any of the other white state-owned universities had displayed such clerical and administrative incompetence for three months or even three weeks, does anyone really believe that PASSHE would have stood by idly and allowed it? In other words, PASSHE saw Cheyney on fire for three consecutive years — whether it was bombed by scheming outsiders or torched by inept insiders — and did nothing about it. Well, on second thought, PASSHE did do something. It waited until Cheyney was nearly burned to the ground in accounting and record-keeping errors and then blamed it despite not having provided sufficient resources and then brought in FAS and then offered piecemeal so-called help for this and some other problems. That purported help included the providing of loans to the residents of a smoldering building who had no way of repaying it due to PASSHE’s decades-long history of treating it like a stepchild compared to PASSHE’s thirteen white children. And those loan shark-like loans that usually result in broken knees could soon result in broken dreams for hopeful Black students and a broken legacy for devastated Black alumni. I say “could,” not “will.” That’s because Heeding Cheyney’s Call (HCC) has come to the rescue like firefighters against arsonists and the FBI against Mafioso loan sharks. HCC consists of hundreds of alumni, students, faculty members, staffers, civic leaders, clergymen/women, community activists, and elected officials. 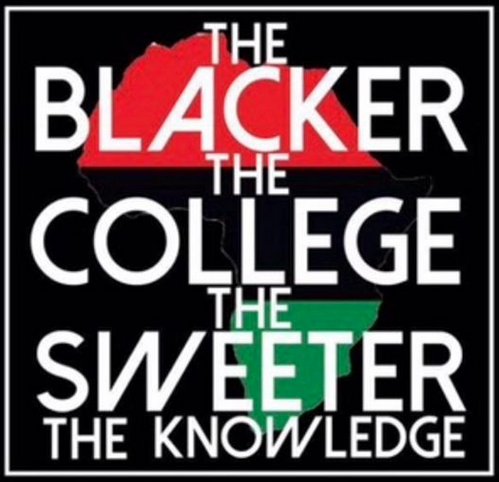 It was founded in 2013 to save and enhance the oldest Black institution of higher learning in America. In early 2013, HCC began negotiations with Corbett administration officials. HCC’s Negotiation Team consists of Dr. Earl S. Richardson, a nationally renowned expert on discrimination in higher education who served as president of Morgan State University for more than a quarter century; attorney Pace J. McConkie, the director of the preeminent Robert M. Bell Center for Civil Rights which serves as a national Historically Black Colleges and Universities (HBCU) legal resource center (that, along with Dr. Richardson, led the recently successful HBCU lawsuit in Maryland); attorney Joe H. Tucker, the head of The Tucker Law Group which is the most prominent Black law firm on the East Coast; Junious R. Stanton, past President of the National Alumni Association; Professor Sonny Harris, former Campus Faculty Union president; and yours truly. HCC’s negotiation sessions with the Commonwealth were somewhat productive in the beginning but eventually became frustratingly unproductive, thereby requiring us to file a major civil rights lawsuit in October 2014. However, because we believed that the Wolf administration would be more receptive to equal rights in higher education, our attorney petitioned for and, in June, 2015, was granted a “civil suspense order” from the trial judge for the purpose of focusing on a quick negotiated settlement as opposed to protracted litigation. HCC understood from the beginning that this negotiation would involve many considerations, including a probable “collaboration” between Cheyney and nearby WCU. Initially, we had no objection to it. But things have drastically changed. As an attorney, I generally do not give any credence whatsoever to rumors. However, I must mention that it has been and continues to be disclosed by many reliable sources that the initial “collaboration plan” has become a “takeover scheme” by WCU or PASSHE, or both, to benefit WCU and to exploit Cheyney by destroying, undermining, or otherwise adversely affecting its historic institutional identity and undercutting its autonomy of its own land, buildings, facilities, departments, and other resources, thereby rendering it subservient to WCU. In fact, a WCU official has gone on record stating that the collaboration will “benefit WCU because WCU is rather landlocked and CU has 275 acres of rolling farmland in Delaware and Chester Counties.” Such a statement could raise legitimate concerns about WCU’s (and PASSHE’s) ulterior motives. PASSHE and WCU, as well as the governor, need to address this issue. And they will because HCC wrote them a powerful letter a few days ago requesting a response to that particular issue along with other essential issues and also requesting a detailed response by next week. If the response is timely and favorable, Cheyney alumni everywhere will be pleased and calm. But if it’s untimely, absent, or unfavorable, Cheyney alumni everywhere will be displeased and angry. And hundreds of them and their supporters will express that anger politically through demonstrations in Harrisburg and economically through boycotts in Harrisburg and Philadelphia. Michael Coard, Esquire can be followed on Facebook, Twitter, and Instagram. His “Radio Courtroom” show can be heard on WURD900AM. Cheyney's impressively powerful, overwhelmingly successful, and absolutely historic protest today (11/10) had hundreds of students/alumni activists, a dozen legislators, and numerous reporters and camera crews present. In fact, we were informed by a Capitol staffer that it was the LARGEST in recent history. Many news articles and photos will be posted later today, starting with this article. (By the way, if you were there today, you made history. If you weren't, you missed history. But it's never too late to join us. In order to make sure everyone has at least a basic understanding about why we're going to Harrisburg, Heeding Cheyney's Call has written the following Fact Sheet. Please read it and spread the word. NEED BUS TICKETS TO OUR HISTORIC PROTEST NOVEMBER 10TH IN HARRISBURG, PA? PLEASE CLICK THE LINK OR THIS TEXT! 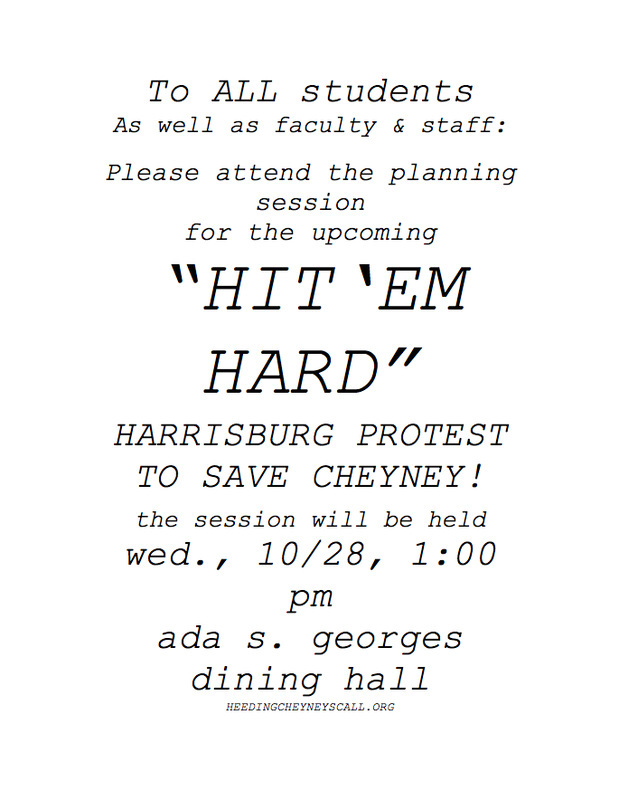 Just one day before he became an ancestor, Professor Sonny Harris asked me to tell the Cheyney family to aggressively expand the fight against racist Harrisburg officials who've been trying for decades to destroy our beloved alma mater and to "Hit 'Em Hard" in the process. 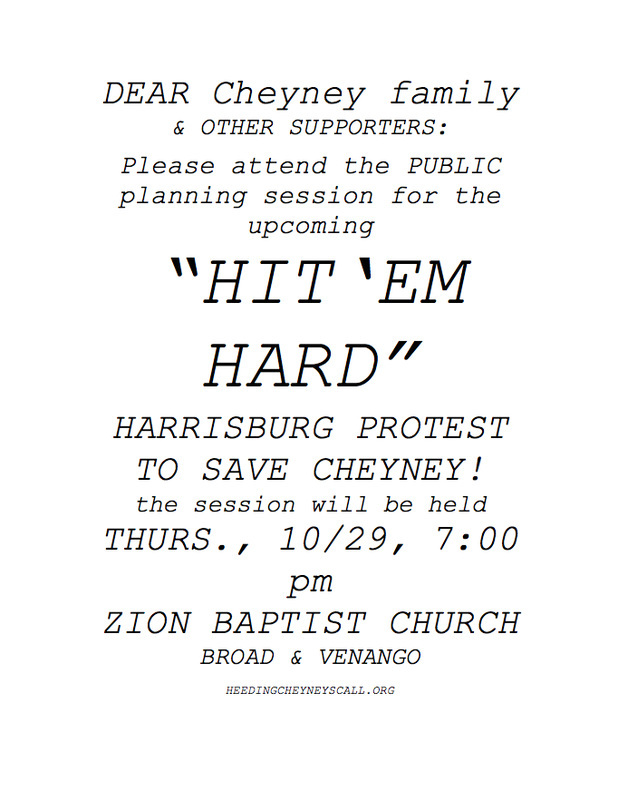 Therefore, Heeding Cheyney's Call will hold a major and confrontational "Hit 'Em Hard" demonstration in Harrisburg on Tuesday, November 10 at 10:30. Stay tuned. Details will be provided and input will be accepted at upcoming campus and Philly meetings. This morning, I lost an elder who is one of the key persons in my life and who helped make me the man I am today. Professor E. Sonny Harris died peacefully in his sleep. There's so much I could say about this wonderful human being who "bleeds Cheyney blue and white," but right now I'll say just two things. No one has done more in the past 60 years than he has to save and fight to enhance historic Cheyney University. 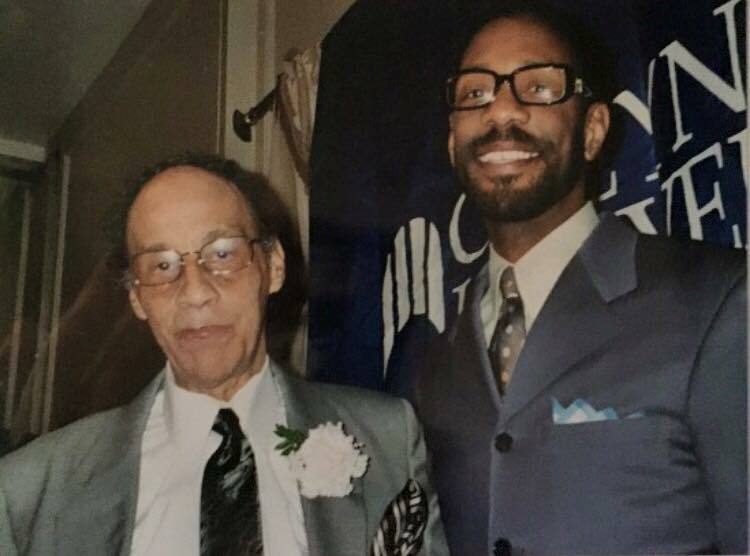 He was a raucous student activist at Cheyney, a dedicated math professor at Cheyney, a committed student government adviser at Cheyney, a fiery faculty union president at Cheyney, the force behind three historic and successful civil rights lawsuits on behalf of Cheyney, and the founder of Heeding Cheyney's Call. In a word, Professor Harris was- I mean is- Cheyney. When I graduated from Cheyney as a poor North Philly kid, I got a full academic scholarship to Ohio State University School of Law. I lived with my single unemployed mother and couldn't afford the travel costs to get to Columbus, Ohio to start classes that September. I was too embarrassed to ask anyone for help, and Professor Harris- as my adviser- knew that I and my family had no money. So what did he do? He volunteered and rented a car for me. He paid for it. He let me drive myself. He gave me a map from AAA road services. I arrived to law school safely and on time. Because of him, I'm a lawyer today and the rest, as they say, is history. In the midst of my unrelenting tears today, I'm too choked up to talk. But I am able to say and to forever mean this: "I love Professor Sonny Harris!" — with Heeding Cheyney's Call. As you may know, last June, Cheyney University turned over to Pennsylvania’s State System Office of the Chancellor responsibilities for our financial aid functions here at Cheyney University when it was discovered that financial aid may have been improperly awarded to Cheyney students over three years, beginning in 2011. In addition, Financial Aid Services, Inc. (FAS) was brought in to reconcile our previous year's federal financial aid awards, disbursements, and student accounts. The reconciliation of Cheyney's federal financial aid is now complete, and FAS has sent the United States Department of Education its full report. 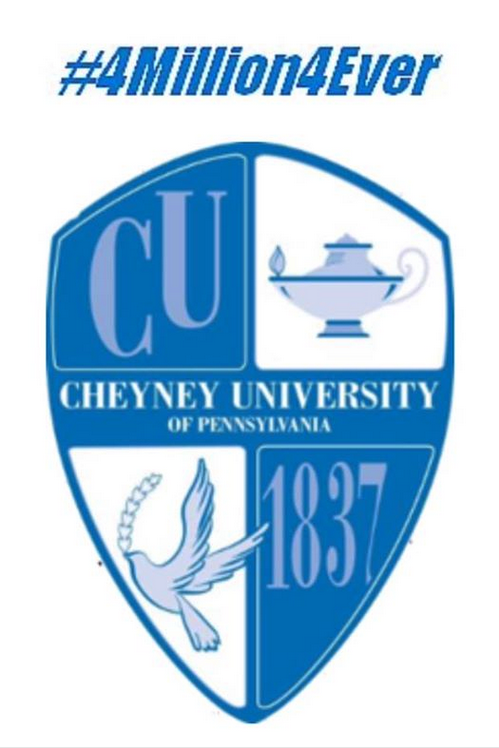 Today, the findings of that report will be made public, and the conclusion is that the University may have improperly awarded $29.6 million to Cheyney students over the three-year period. Please know that we have put many new measures in place to bring the University into compliance with state and federal regulations, including changes in our administrative policies, procedures, and personnel. Processes are in place to ensure that our information systems and data are properly aligned and integrated to support the awarding of financial aid and student progress to graduation. With the help of FAS, the State System, and our Cheyney staff, we are doing everything that we can to make sure that we are compliant going forward. 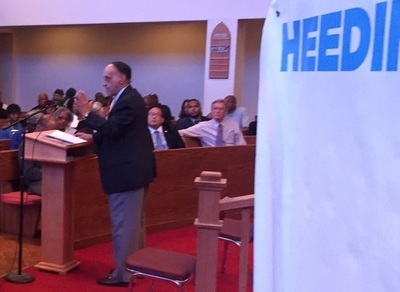 Facebook pictures from our historic meeting at Zion Baptist Church on North Broad St., Philadelphia, PA on Wednesday, July 15, 2015. THE REBIRTH OF CHEYNEY: BIGGER, BETTER, & BLACKER! Historic Cheyney University- an all-time great institution- now has an all-time low student enrollment with an all-time high budget deficit. In other words, until just a few weeks ago, Cheyney University’s very existence was in jeopardy due to the Commonwealth of Pennsylvania’s decades-long racial discrimination in violation of federal law, state law, and a 1999 signed agreement. However, Heeding Cheyney’s Call (HCC), which was founded in early 2013, began informal negotiations later that year with Commonwealth officials but was forced to file a major federal civil rights lawsuit on October 29, 2014 when negotiations stalled. HCC’s Negotiation/Litigation Team consists of Dr. Earl S. Richardson- a nationally renowned expert on discrimination in higher education who served as President of Morgan State University for more than a quarter century, attorney Pace J. McConkie- the Director of the preeminent Robert M. Bell Center for Civil Rights, and attorney Joe H. Tucker- the head of The Tucker Law Group, which is the largest and most prominent Black law firm on the East Coast. Also included on HCC’s Negotiation/Litigation Team are Junious R. Stanton- immediate past President of the National Alumni Association, Professor E. Sonny Harris- former Campus Faculty Union President, and attorney Michael Coard- former Council of Trustees Member and Student Government Officer. HCC will hold a PUBLIC MEETING on JULY 15 at 6:30 pm at ZION BAPTIST CHURCH at 3600 North Broad to explain everything about the lawsuit, the rumors, the Framework, and the strategies. But HCC needs you to attend and to provide your input. For more information and also to join HCC, log on to the website at HeedingCheyneysCall.org, the Facebook page at Heeding Cheyney’s Call, the Twitter page at @HeedingCheyneys, and the Instagram page at heedingcheyneyscall1. THE REBIRTH OF CHEYNEY: BIGGER, BETTER, & BLACKER! For more info, contact us on Facebook at Heeding Cheyney's Call, on Instagram at heedingcheyneyscall1, and on Twitter at @HeedingCheyneys. Or email us at HeedingCheyneysCall@gmail.com or call us at 215-552-8714. I am writing this post today to publicly inform everyone that Heeding Cheyney's Call "expects" to hold a major press conference within the next few months regarding the status of the historic civil rights lawsuit that we filed in October 2014 to save and enhance Cheyney University. I cannot go into detail right now, but I can say that it "looks" like the news will be GREAT for Cheyney University. Stay tuned. Avenging our Cheyney University ancestors by suing for their Cheyney University descendants! "Justice delayed is justice denied. But better late than never, dammit! That's exactly why ﻿﻿﻿ Heeding Cheyney's Call﻿﻿﻿ filed its major federal civil rights lawsuit today following the historic and successful lawsuit filed 34 years ago in 1980." In at least two ways, the Pennsylvania Auditor General's report actually supports the claims raised in the lawsuit recently filed by Heeding Cheyney's Call. One: The current and past Governors along with PASSHE did not equitably provide the funds and resources Cheyney needed to fairly compete with the 13 white state-owned universities. Two: Those Governors and PASSHE appointed, retained, and extended the contracts of inept Presidents at Cheyney. Accordingly, for example and as a perfect analogy, you don't hold the bus driver (who was hired despite several DUIs and kept on the job despite numerous speeding tickets) legally liable when he causes an accident but instead you hold SEPTA legally liable for hiring him, keeping him, and renewing his employment. In our case, the Presidents are the bus driver and the Governors along with PASSHE are SEPTA. We'll see 'em in court- and tell 'em to bring a copy of the Auditor General's report. Dear Friends, although several negotiations with the Commonwealth's attorneys and budget officials were impressively productive initially, they have become blatantly unproductive recently. See the YouTube video of HCC's intention to file a Federal lawsuit at least a week or more before the November 4th elections. HCC is not only alive and well; we're also thriving in our ongoing battle "to save and enhance historic Cheyney University by pursuing parity through equity." We've retained the largest Black law firm on the East Coast- i.e., The Tucker Law Group, headed by the preeminent Joe H. Tucker, Esquire. We've enlisted the services of the country's top scholar in the field of discrimination against HBCUs- i.e., Dr. Earl S. Richardson, former President of Morgan State University for more than a quarter century. We've acquired the support of the country's leading HBCU legal think tank- i.e., The Robert M. Bell Center for Civil Rights, headed by the prominent Pace J. McConkie, Esquire. HCC appointed three members of our Steering Committee to form a Negotiation/Litigation Team (consisting of National Alumni Association President Junious R. Stanton, former Campus Faculty Union President Professor E. Sonny Harris, and HCC attorney Michael Coard, Esquire), which includes HCC's lead attorney Mr. Tucker, Dr. Richardson, and Mr. McConkie. This team has met several times in Harrisburg with Governor Tom Corbett's staff, consisting of lawyers from the Governor's Office of General Counsel, lawyers from the Pennsylvania State System of Higher Education, and an official from the State Budget Office. Because those meetings are strictly confidential, we cannot disclose the details. However, we can point out that those meetings are progressively productive- at least so far. Within the next few months, we expect to issue a public announcement that will provide all of the pertinent information. 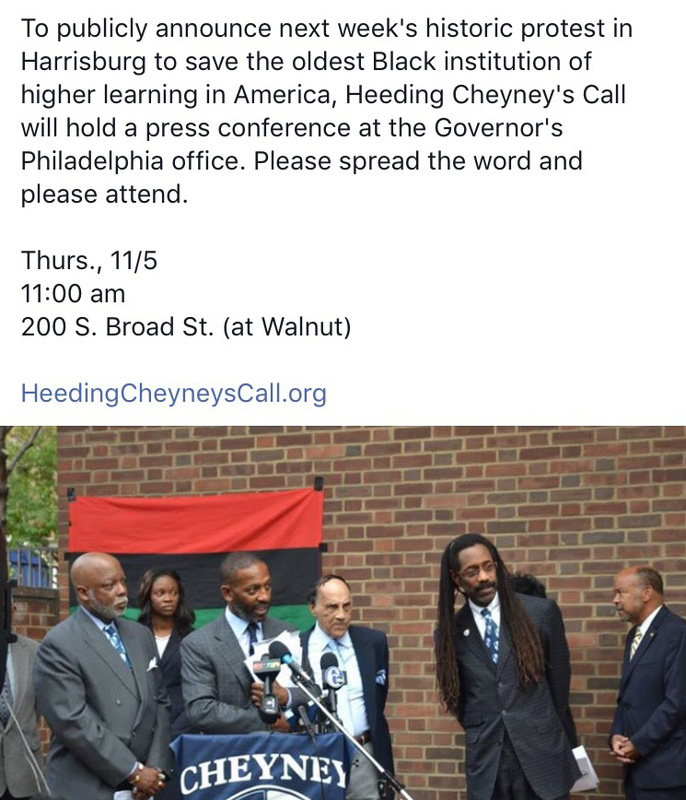 If anyone has any questions or comments, please contact HCC here on Facebook, on our website at HeedingCheyneysCall.org, on Twitter at @HeedingCheyneys, or by phone at 215-552-8714. A comprehensive review of the day’s events in the Pennsylvania Capitol. Heeding Cheyney's Call took its battle to the State Capitol in Harrisburg on 3/17. 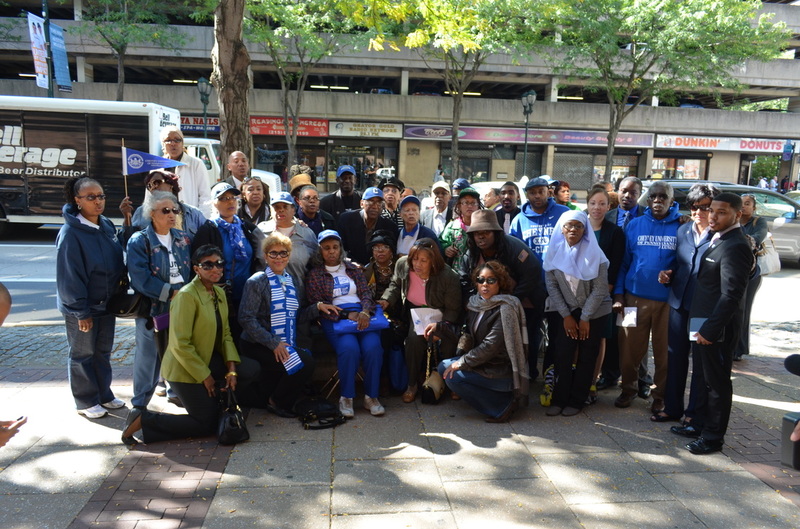 Also special thanks to the major support shown by Cheyney Alumni who attended the hearing!! On October 17, Heeding Cheyney's Call submitted a powerful rebuttal to the Governor's October 3 letter (in connection with our initial September 23 correspondence). That rebuttal is part of our relentless effort to achieve "parity through equity" for the oldest Black institution of higher learning in America. We- meaning you AND us- are making tremendous progress in our battle to save and enhance our historic alma mater! Because the four HBCUs in Maryland won a major federal court victory yesterday in two of their three key legal arguments (regarding the duplication of programs and the creation of courses that would attract more students), Cheyney has indirectly won a major victory as well. And that's because our case is quite similar to- but actually even stronger than- theirs. Within the next 48 hours, Heeding Cheyney's Call will issue a detailed analysis of that favorable federal court ruling. 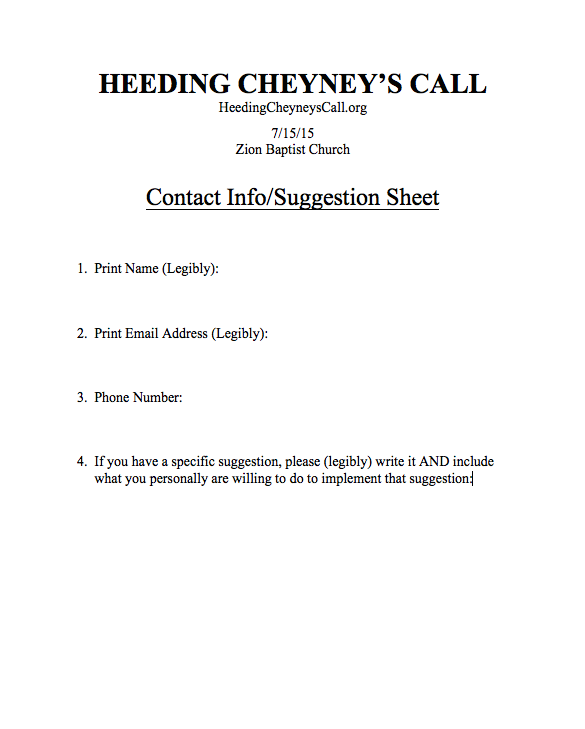 "Click Here for More Heeding Cheyney's Call Online Articles"
Heeding Cheyney's Call submitted to the Governor and other named potential defendants. "Heeding Cheyney's Call" (which is a name based on the alma mater lyrics) is a widespread and broad-based coalition of students, alumni, faculty, staff, regional civic leaders, and many other active supporters. 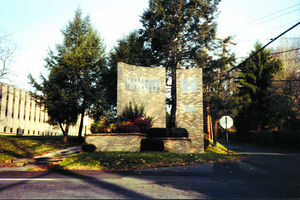 It is the original and official Cheyney University organization that was formed to preserve and enhance this historic institution with the goal of "parity through equity" - relative to Pennsylvania's thirteen traditionally white institutions - by engaging in social activism, by pursuing political recourse, by filing lawsuits, and/or by any means necessary. 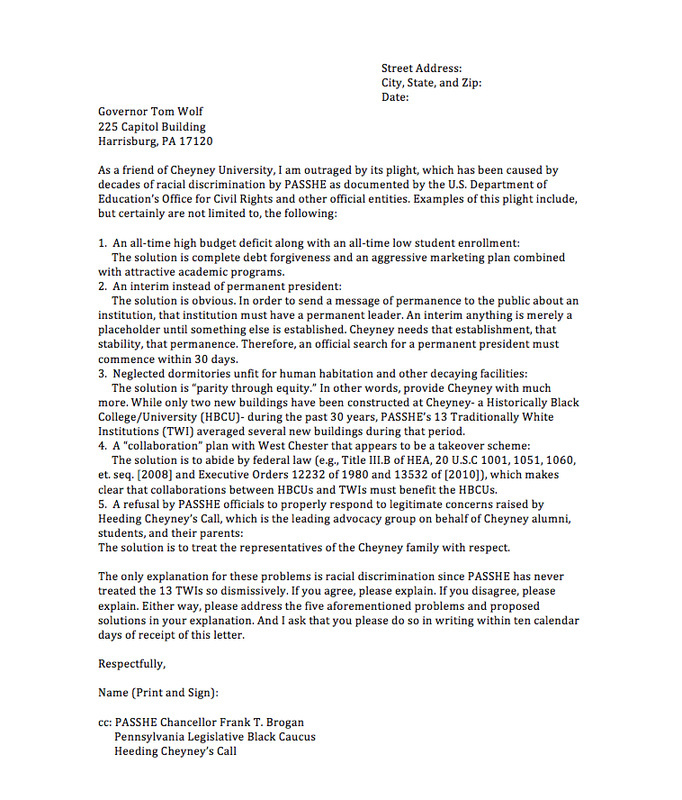 attached June 19, 2013 letter that the Steering Committee of "Heeding Cheyney's Call" sent to the United States Department of Education's Office for Civil Rights. And for information regarding the continuing legal basis for our activism, please review the attached September 23, 1980 Federal Civil Rights lawsuit complaint. our phone number is 215-552-8714. Please spread the word. And please join us by expressing your support for our efforts.